This Facebook Plugins for WordPress is the ultimate and most advanced plugin to integrate Facebook Plugins, Dialogs and Facebook comments into your blog or website. It’s using WordPress shortcodes to make it very simple to add a Facebook plugin or dialog into any blog post or page. The plugins also comes with 4 widgets ready to be customized + a way to automatically add a Like button and/or the Facebook comment system into all your posts and pages. - 11 Facebook plugins that can be integrated with one line of code. - 3 dialogs using native Facebook popups. - Shortcode support for all the plugins and dialogs. - Automatically add a Like Button to all your posts or pages. - Automatically integrate Facebook comment to all posts and pages. - Easy way to customize the look and options of the plugins. - A way to disable the WordPress default comments. - Rich documentation and each shortcode parameter is documented. - Compatible with the Facebook WPress for WordPress. Demo of all Plugins, Facebook comments and Dialogs. - Removed the “Live Stream” deprecated by Facebook. - Customize in which posts and pages the automatic like button, and Facebook comment are displayed. - Added a way to use the featured image when a page is liked (Open Graph protocol integration). - Added a way to enable the comments moderator tool by declaring the admin(s). 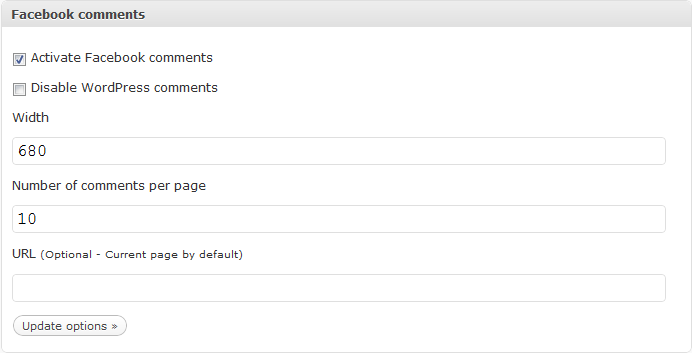 - Added an option to set a comment header title from the plugin settings. - Added color scheme support for all comments (light + dark).